Here are my top 5 picks for the weekend - enjoy! SOMETHING TO LINGER OVER: Laylock.org is written by Derya Davenport who I have been following on Twitter for ages (she tweets entire knitting pattens in 140 characters or less!) but it was only this week that I took some time to look around her blog... and I love it! There are some beautiful patterns, lots of useful printables and downloads and stunning photography. Check it out - I think you'll love it too. 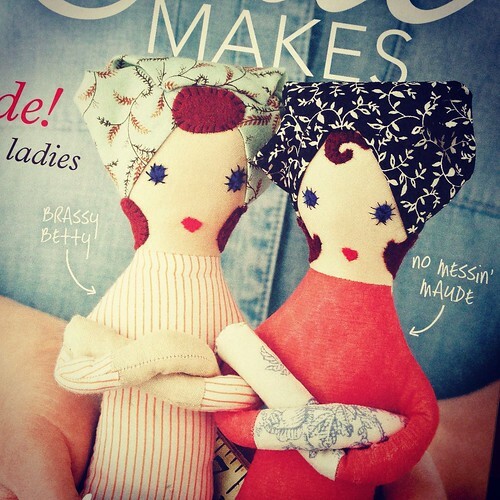 SOMETHING TO READ: Issue 28 of Mollie Makes is on the shelves and it's vintage themed with a retro 80's jumper pattern (knitting), handerchief make-overs and a bow brooch kit (crochet), and these gorgeous rockerbilly dolls (sewing) plus lots more. SOMETHING TO MAKE: It's not quite warm enough for bare shoulders, so this lovely 'Something Lacy' shrug pattern might make a useful weekend project. It's pretty, quick to knit and has a simple consturuction... and the pattern is free to download. SOMETHING TO WATCH: I am totally hooked on the Must Stash Podcast - the hosts are so lovely and if you get your knitting and a cuppa (or a glass of something cold) you could almost be at a friend's house. This is a relatively new video podcast and so there are only a few to catch up on. SOMETHING TO DO: If you have plenty of time on your hands, why not learn a new skill? You already know I'm a huge fan of Craftsy and as a result of enjoying the flexibility to learn online at home and at my own pace, I'm also revewing some courses by The Amazings. These are online (and real life) classes from a team of "Elders" - ie skilled craftspeople over 50. I'll tell you more about them on another occasion, but you might want to check out the link in the sidebar (at the time of writing) as they are currently offering the first class for free. Well that should be enough to keep you out of trouble for a couple of days. For those who can get to London for the WWKiP event, I hope you have a wonderful time. I won't be able to make it, but you can follow my antics on Instagram - I'm doing something exciting, and will also be looking out for people knitting in public! I love Derya, her aesthetic is beautiful. She does some really interest design work too. I am also a big fan of Must Stash. They are really warm and funny. You are right about feeling like you are in the room with your friends. I'm just learning to knit, but I'll be spending time this weekend practicing. In the meantime I'm inspired by your link love. These are great recommendations to check out Sarah ^^. I love, love those Rockabilly dolls. They are too adorable! Will check out the site. Mahalo for always leavin' a comment on KO. I wasn't able to email you back so I'll try to respond here on your blog. Have a great weekend. I love Must Stash too! I think I'm going to join their Tour de Fleece group even though I ust started spinning this week. Hopefully if I spin everyday of the challenge I'll improve in a hurry! love the shrug, it looks like a fun knit! love the way you present your links!